SagaTM is indicated for the treatment of adults (18 years of age) with upper and lower respiratory tract infections caused by susceptible strains of microorganisms: Sinusitis, Community and hospital acquired pneumonia, Bronchitis, Acute Bacterial Exacerbation of Chronic Bronchitis, Chronic Obstructive Pulmonary Disease (COPD), Lung abscess and all other RTIs. Besides, SagaTM can also be indicated in Urinary Tract Infection including gonococcal and non-gonococcal urethritis, chancroid and other STD\'s, Skin and Soft Tissue Infections. 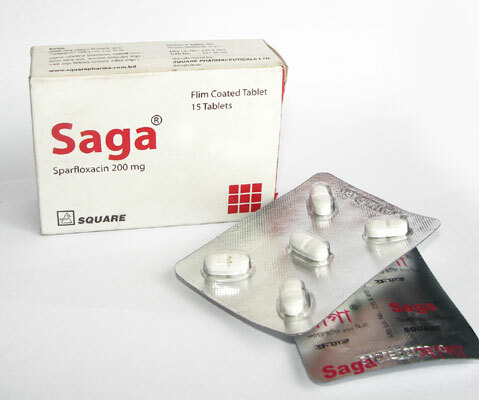 In patients with normal renal function the recommended daily dose is two tablets of SagaTM on first day as a loading dose, thereafter one tablet of Saga\" tablet is to be taken every 24 hours for a total of 10 days of therapy. (11 tablets). The recommended daily dose of SagaTM in patients with renal impairment (Creatinine clearance < 50 ml/min) is two tablets of 200 mg taken on the first day as a loading dose. Thereafter, one tablet of 200 mg should be taken every 48 hours for total 9 days of therapy (6 tablets). SagaTM can be taken with or without food. Each box contains 15 tablets in blister pack.